The 2005/06 CAS project leader is the alumnus of the month for October 2018. 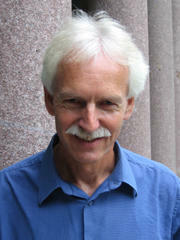 Jakob Lothe, a professor in the Department of Literature, Area Studies and European Languages at the University of Oslo (UiO), served as a CAS project leader during the 2005/06 academic year. His project, Narrative Theory and Analysis, examined modernist fiction and Holocaust narratives to explore the interpretive and moral significance of how a narrative is structured and understood. Lothe has published a number of books since his stay at CAS ended. Two of them, collections of Holocaust narratives titled Tidsvitner and Kvinnelige tidsvitner, made the Norwegian weekly newspaper Morgenbladet’s best books of the year list in 2007 and 2013, respectively. Lothe looked back on his stay at CAS in an interview last month. Why did you apply to CAS? I applied to CAS because the design and setup of the Centre appealed to me. I have always been interested to work in small research groups, and the invitation to design my own research project with a team of scholars intent on exploring the constituent ideas of that project struck me as a wonderful opportunity. What do you remember best from your year at CAS? I have fond memories from my year at CAS, and I would like to highlight the friendly atmosphere and the team members’ genuine interest in, and support of, each other’s work. In one sense this is perhaps only to be expected when a team of scholars is engaged on the same project, yet it does not always happen. One essential reason for this kind of mutual interest and care was, I think, the strong and consistent support of the CAS scientific director at the time, Professor Willy Østreng. Østreng and his team were not just highly professional administrators, they were also unfailingly friendly and inspiring. How has your career developed since your stay at CAS? The year at CAS has furthered my career in ways I could not possibly pre-empt. Most importantly, our research collaboration over the course of the year at CAS encouraged me to extend my interest in modernist narrative to other forms of narrative, including Holocaust narratives. Thus, in addition to publishing books on modernist authors Joseph Conrad (2008) and Franz Kafka (2011), my team also published After Testimony: The Ethics and Aesthetics of Holocaust Narrative for the Future (2012). This book proved a strong basis for Narrative Ethics (co-edited with team member Jeremy Hawthorn, 2013) and Etikk i litteratur og film (2016), a book on whose English version I am currently at work. The interest in Holocaust narratives has also resulted in two volumes of interviews, Tidsvitner (co-edited with team member Anette Storeide, 2006) and Kvinnelige tidsvitner (edited, 2013, English translation Time’s Witnesses, 2017). The humbling experience of being elected a member of the American Philosophical Society in 2018 would not have become part of my life without the year at CAS. What advice do you have for future CAS project leaders? As indicated in my response to the first question, the possibility of leading a CAS project is a unique opportunity to design an original project in collaboration with scholars whose research interests you share and whose judgment you trust. As an ambitious research project involves an element of risk, it is important to be courageous in the sense of really believing in, and developing, your own ideas. Aided by the input of your team members, these ideas can form the basis for, and then develop into, a project that significantly improves our understanding of the set of problems under consideration. This interview was first published in the CAS newsletter. Sign up here to get the latest news from the Centre delivered directly to your inbox every month.